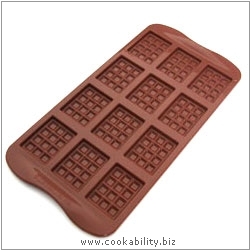 A range of easy to use, adaptable, long lasting and non toxic chocolate moulds. They are safe for use in the oven, microwave, fridge and freezer. Become a chocolatier in your own home. Melt 200g of your favourite chocolate, adding any extras to taste, then pour into the mould. Put in the fridge to set and you have your very own creations to nibble on, or give away to very special people. The moulds are also perfect for fudge, fondants or ice cubes.